SpaceX launched Friday a spacecraft that contains equipment NASA intends to aid activities onboard the International Space Station, including research on artificial intelligence, cellular biology and Earth science. 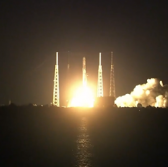 The Dragon spacecraft, propelled by the Falcon 9 rocket from Space Launch Complex 40 at Cape Canaveral Air Force Station, is the 15th ISS cargo flight SpaceX has conducted for NASA’s Commercial Resupply Services contract, the space agency said Friday. The spacecraft carries over 5,900 pounds of load, including experimentation and investigation equipment such as the Crew Interactive Mobile Companion, Micro-12 and Ecosystem Spaceborne Thermal Radiometer Experiment on Space Station. The Micro-12 materials for cellular biology research will aid the development of microbial fuel cells through the identification of the effects of microgravity on bacterial growth, gene expression and electron transfer. ECOSTRESS will use a space-based measurement of plant change and response to water access to provide potential approaches to agricultural water management. The spacecraft will also deliver a Canadian-made Latching End Effector spare that is similarly built to the robotic arm the Canadarm2 uses to grapple spaceships and to roam the orbiting outpost. NASA will hold a live broadcast of the spacecraft’s rendezvous, capture and installation with the ISS on July 2. Ricky Arnold and Drew Feustel, U.S. astronauts onboard the ISS, will use the Canadarm2 to grab the Dragon spacecraft. SpaceX’s spacecraft is scheduled to commence in August its mission to return to Earth to allow NASA to retrieve 3,800 pounds of hardware, research and supplies from the ISS.